Michael Hunter, the leading expert and custodian of Robert Boyle’s (1627-91) legacy, delivered a paper last night at a seminar here at the University, entitled “‘Physica Peregrinans’: Robert Boyle, His Informants and the Role of the Exotic in Late Seventeenth-Century Natural Philosophy.” Hunter examined Boyle’s records of interviews he conducted with travelers returning from exotic locations throughout the world. Boyle intended to publish these interviews in a book, Physica Peregrinans, or “The Traveling Naturalist: Containing Answers given to Severall Questions propunded by the Author to Navigators & other Travellers in remote Countreys .” During the Q&A, it became apparent that Boyle rejected the scholastic, Aristotelian approach to common experience. According to Hunter, for Boyle “nature was in fact often surprising and exciting in its fecundity and variety, and people’s conception of what was possible needed to be expanded accordingly.” Equally noteworthy, it seems that Boyle used empirical investigation in support of the supernatural in nature—that is, he offered “a natural history of the supernatural,” as Peter Harrison put it during the discussion following the paper. In his Robert Boyle: Between God and Science, Hunter aims to bring this fact out. As a natural philosopher, Boyle not only dabbled in all branches of physics, he also experimented in alchemy, anatomy, botany, biology, medicine, and mathematics. He wrote on epistemology and moral philosophy, on scientific method and scientific theory, and just as vigorously labored with biblical exegesis and theology. Indeed, his first two published books were Some Motives and Incentives to the Love of God (1659) and New Experiments Physico-Mechanical, Touching the Spring of the Air and its Effects (1660). Natural philosopher and religious apologist, Boyle sought to justify the ways of God to men. Boyle was so committed to his faith that, upon the urging of Archbishop Ussher, he learned Greek, Hebrew, Syriac and Aramaic in order to read the Bible in its original languages. Hunter even suggests that Boyle’s interest in natural philosophy and experimentation was largely spurred by his concern to combat the rise of atheism and materialism. 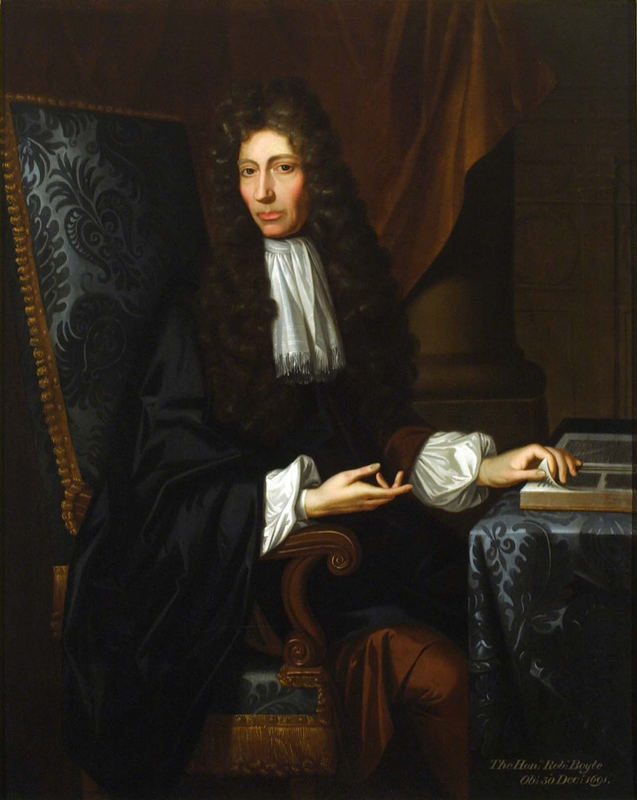 Seventh son, gentleman, wealthy landowner, Etonian, visitor to the Continent, Protestant educated, multilinguist, moralist, alchemical adept, forerunner of modern chemistry, champion of experimental philosophy, popularizer of the air-pump, promoter of natural philosophy, early Fellow of the Royal Society, formulator of what came to be called ‘Boyle’s law’, proliﬁc author, citizen of the Republic of Letters, a director of the East India Company, principled lifelong celibate, medical reformer and practitioner, hypochondriac, man of tender conscience, man of charity, pious believer, Bible reader, lay theologian, apologist for reasonable Christianity, high priest of nature, advocate of natural theology, founder of the eponymous lectureship in defence of the faith, backer of foreign Bible translations, supporter of overseas missions and governor of the Corporation for the Propagation of the Gospel in New England—Boyle was all of these things and more.